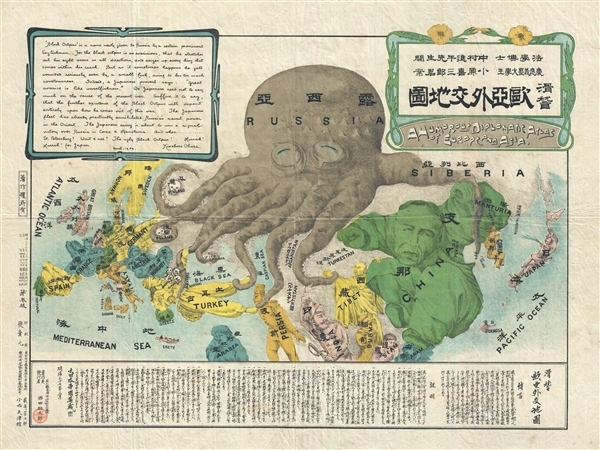 Extremely rare Japanese perspective satirical 'Octopus Map' of Asia. A Humorous Diplomatic Atlas of Europe and Asia. / 滑稽欧亜外交地図 / Kokkei Ō-A Gaikō Chizu. Black Octopus is a name newly given to Russia by a certain prominent Englishman. For the black octopus is so avaricious, that he stretches out his eight arms in all directions, and seizes up every thing that comes within his reach. But as it sometimes happens he gets wounded seriously even by a small fish, owing to his too much covetousness. Indeed, a Japanese proverb says: 'Great avarice is like unselfishness.' We Japanese need not to say much on the cause of the present war. Suffice it to say that the further existence of the Black Octopus will depend entirely upon how he comes out of this war. The Japanese fleet has already practically annihilated Russia's naval powers in the Orient. The Japanese army is about to win a signal victory over Russia in Corea and Manchuria. And when ... St. Petersburg? Wait & see! The ugly Black Octopus! Hurrah! Hurrah! for Japan. It has been argued by New York collector P. J. Mode, and others, that this map was probably intended for an English as much as a Japanese audience. He reminds us that the Russo-Japanese war was primarily a naval engagement. The map served as a warning to the British – stay out of the war. By April of 2004, on month before Ohara printed this map, the Japanese had already defeated the Russian Navy. Only foreign influence, potentially in the form of the powerful British navy, could have prevented the Japanese from taking Port Arthur. On the other hand, the map also clearly expresses Japanese Imperial intentions. The English suggest boldly suggests that the Japanese may well advance as far as St. Petersburg. In terms of the geographical representation of central Asia, it is noteworthy that China's borders are not that of Qing China, buy rather are severely limited, excluding Chinese claims to Tibet and Turkestan. This map was drawn by Kisaburō Ohara while a student at Keiō Gijuku University. It was published by Suketarō Nishida. The map is rare by any standard with only two institutional collection examples identified by the OCLC. Very good. Some wear on original fold lines. Even overall toning. Persuasive Maps: PJ Mode Collection, 1145. Boston Public Library, Leventhal Center, G5690 1904 .O33. Baynton-Williams, A., The Curious Map Book, page 196. OCLC 498191044.